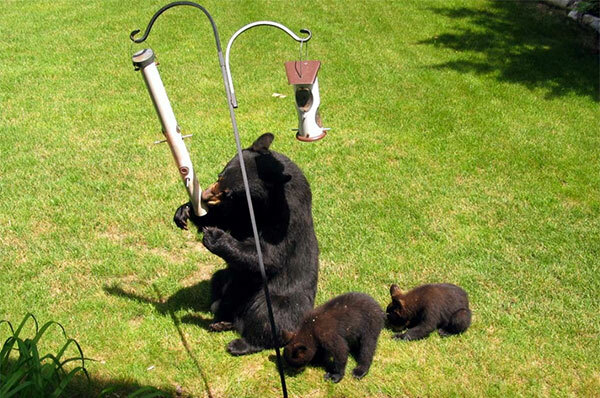 Cutline: Bird feeders are an easy source of food for hungry bears in the spring. Photo courtesy of the Michigan DNR. Spring is here, which brings warmer temperatures, longer days and wildlife emerging from their winter homes. The Michigan Department of Natural Resources reminds residents that black bears are among those animals that are now awake and have left their dens. At this time of the year, wildlife officials receive many calls about bear sightings and bears damaging bird feeders, trash cans and grills. “Bears are hungry,” said DNR bear specialist Kevin Swanson. “They are looking for food after spending months in their dens. While we might not think of bird feeders and trash cans as food sources, a hungry bear certainly may.” Bird seed especially is attractive to bears because of its high fat content and easy accessibility. Once bird feeders are discovered, bears will keep coming back until the seed is gone or the feeders have been removed. Bears that are rewarded with food each time they visit a yard will remember these food sources. This can create an unsafe situation for the bear and become a nuisance for landowners if a bear continuously visits their yards during the day and repeatedly destroys private property in search of food. Anyone who is experiencing problems with bears and has removed food sources for a period of two to three weeks, but has not seen results, should contact the nearest DNR office and speak with a wildlife biologist or technician for further assistance. Learn more about Michigan’s black bear and how to prevent potential problems by visiting www.michigan.gov/bear.